Some parts of my skin are really rough and dry. It seems like every lotion I use for the problem, hasn't been very effective for me when it comes to the moisturizing factor. My knees and elbows are frequently dry, and rough in texture. This winter weather has not been much help either. The cold weather only just adds to my skin dryness problem. Although I don't mind certain lotions, sometimes, I want a break, and instead, go for something that is a little more gentle on my skin. I was really happy when I received the Skin MD Natural Shielding Lotion + SPF 15 ($25.00). It could not have come at a better time. I chose to go with the Skin MD Shielding Lotion that contains the SPF of 15-the Skin MD Natural Original Formula ($18.00), is available as well. I really like lotions that contain SPF because not only am I giving my skin moisture, but I am ensured that I am getting that extra skin protection as well. This shielding lotion is also a great help for people who suffer from certain skin conditions like Eczema and Psoriasis. Those kinds of skin problems leave the skin very dry. I don't suffer from any of those conditions, but according to Skin MD, this shielding lotions provides skin with a barrier that helps protect it against harmful "outside chemicals and irritants." It also helps lock in skin's moisture which works to help the skin heal itself. 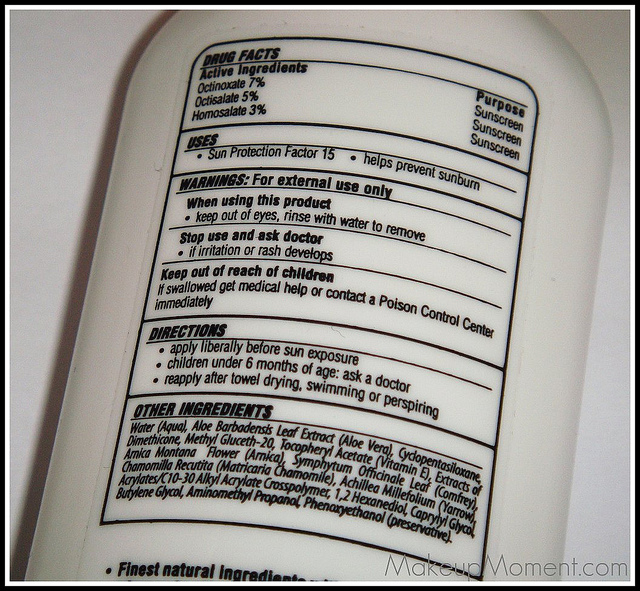 From the ingredients list, I noticed that this lotion contains skin friendly ingredients such as Aloe Vera and Vitamin E.
My skin is dry, oily, sensitive, and acne-prone. I think this is what is called combination skin? I also react very easily to products that don't agree with me. This lotion can be used on the face, body, and hands. I first tried this lotion on my face and when they say that this stuff is moisturizing, they are not joking. It spread easily, it quickly absorbed into my skin, and there was no greasy residue on my face. The consistency of the product is just perfect if you ask me. The lotion is not too thick, and not too thin. Just right. I did notice a smell of the Aloe I believe it was, but it is not offensive at all. I quite like the calming fragrance. I also noticed that my foundation and face makeup just glided right on and my skin just looked amazing. 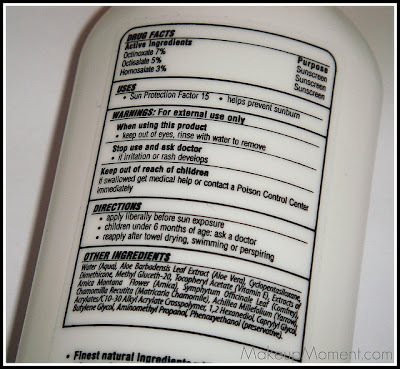 But unfortunately, this lotion caused the appearance of whiteheads and a weird small rash/irritation on my face. It just appeared out of nowhere. Luckily the rash went away after 1 hour or so. I tried applying the lotion again to my face just to see if I would get the reaction again, and alas, I did. It is so unfortunate that I have to stop applying this lotion to my face because, I really did love it's superb moisturizing properties. But not all is lost. I can still use this lotion on my body with no problems. I apply it to my elbows, knees, arms, and it works wonderful! 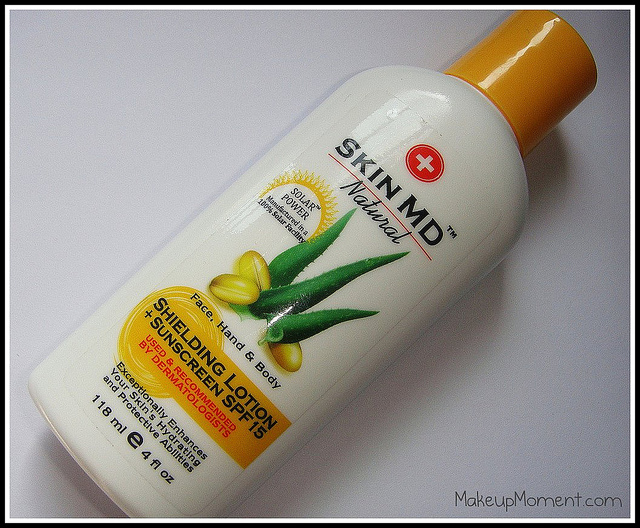 The dryness on my elbows are gone as soon as I apply the Skin MD Shielding Lotion. I have been using this lotion for about 1 month or so, and I can honestly say that it is one of the better-working lotions I have used when it comes to moisturizing my body and dry areas. What do you all think of Skin MD Natural Shielding Lotion? Let me know in the comments section! Note: I noticed from the Skin MD website that they seemed to have changed the packaging of the lotions. Disclaimer: I received this product from Skin MD for review consideration only. I am not affiliated with the company and as always, my reviews are 100% honest. It is unfortunate that you could't use it on your face!! Have very sensitive skin too! I know! I was really hoping this would play well with my face because, it moisturizes amazingly well and my face needs all the hydration it can get.